We began our tour on foot near the old Santa Paula railroad station, once a stop on the Southern Pacific coast line. Today, the Fillmore & Western Railway uses the 1887 depot for the terminus of its tourist train that originates in Fillmore. It also houses the local art museum. Directly across the street from the railroad station is a most unusual memorial. 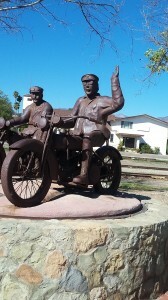 It is a statue of sorts of two policemen on motorcycles. It memorializes an event that took place at midnighton March 12, 1925, the sudden collapse of the St. Francis Dam in San Francisquito Canyon. The abrupt release caused a 120 foot wall of water to pour into the Santa Clara River bed menacing all the cities along it, including Santa Paula. Two motorcycle policemen racing ahead of the flood, sirens wailing, warned countless sleeping people of the impending disaster, thereby saving lives. 431 people were swept away by the flood, making it the worst California disaster since the San Francisco earthquake. We continue our walk towards Main Street, only a block away. 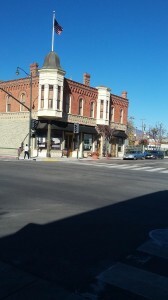 We plan to casually look at the town, especially the large murals that have been painted throughout the downtown area. At the corner of Main and 10th Street stands a most unusual building with an old fashioned cupola extending from one of its corners. It was once the headquarters of the Union Oil Company and dates from 1890 when Santa Paula was a center of the petroleum industry. Today the building is an oil museum. At this same intersection is a large mural celebrating Santa Paula’s Latino culture. As we stroll through the village-like atmosphere of the town, we note the Latino influence in the many Mexican restaurants and shops. Keeping a lookout for more murals, we spot another one in the next block as we walk west. It is a mural depicting the way Santa Paula looked in 1910, far different from the town of today. The most spectacular mural is a gigantic one advertising Santa Paula as the Citrus Capital of the World. We had seen another mural near the railroad station celebrating Santa Paula’s artists and architects, but it was partially shaded by a gigantic Moreton fig tree. Sana Paula is a lovely town set in the middle of orange and lemon groves and acres of avocados with hills on both sides, a kind of paradise. Outside of town are many fruit stands selling citrus and other products fresh from the trees. 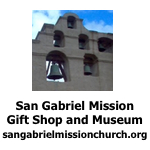 I have visited Santa Paula many times and have always felt that it was special place. I liked it especially when the packing houses were in full operation and iced refrigerator cars were lined up by them to be loaded. Long trains of yellow refrigerator cars left the valley every day. Today, trucks haul it all and the spurs leading to the packing houses rust or are torn up. There are several places of note in the town that we did not visit on this trip, but we have seen them before. One is the famous Glen Tavern Inn and Restaurant built in 1911 during Santa Paula’s oil boom. They have well-appointed rooms, a wonderful lounge and an Italian restaurant. It is worth a visit to the lounge, to walk through its elegance or sit for a while. other highlights of the town are the art museum and the agricultural museum where agricultural implements new and old are on display. The statue is a memorial to the two policemen who warned people about the approaching flood in the middle of the night in l925. 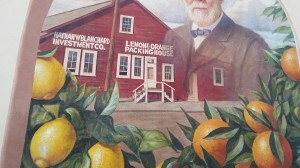 This is a mural depicting Santa Paula as the citrus capitol of the world. The former headquarters of the Union Oil Company is now an oil museum. 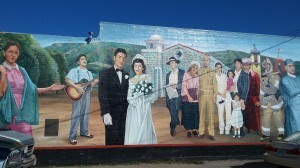 The mural depicts Latino life in Santa Paula and the Santa Clara River Valley.